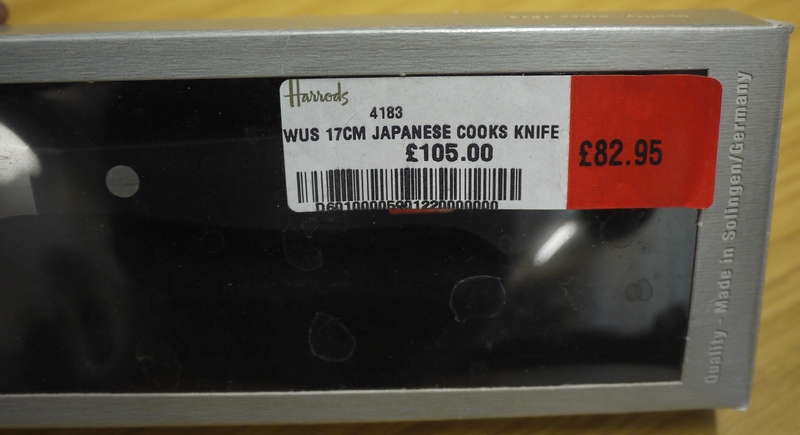 Why does my Stainless Steel Knife Corrode? My metallurgist colleague was very disappointed in this knife because she believed that stainless steel wouldn’t corrode. Unfortunately if left in still water oxidation pitting will occur in all stainless steels. My colleague was very surprised to get corrosion in this knife because it is usually hand washed and then just left with a little water on it, similar to other utensils, but after six months it had started to rust. 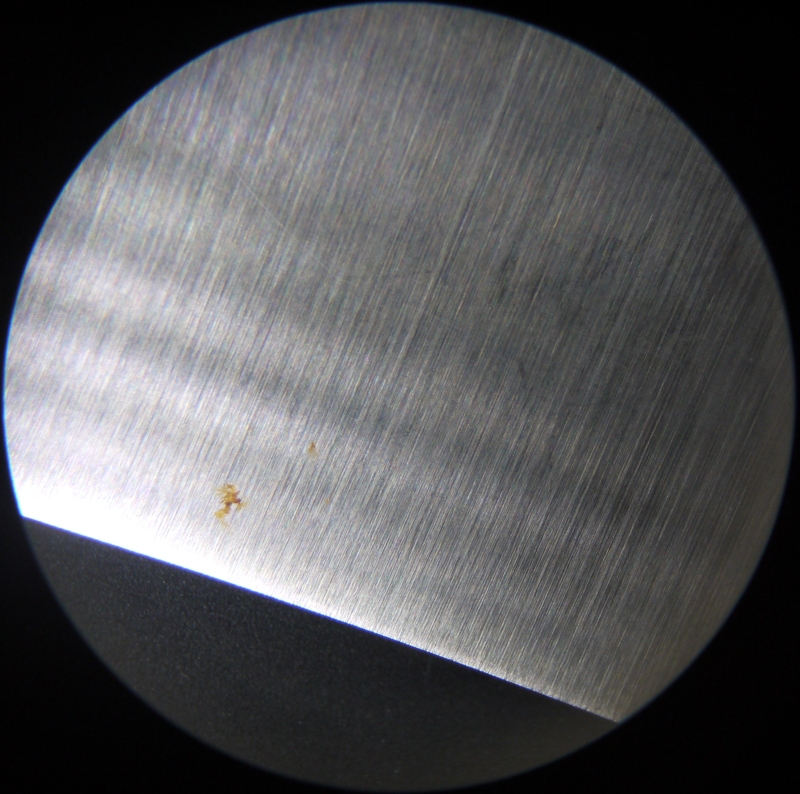 The corrosion may be the result of the relatively high carbon content in the knife, which means it is likely to form carbide particles which act to sensitise the steel. X50CrMoV15 is a German standard with around 0.5 wt% carbon (percentage by weight) and total around 15 wt% chromium, molybdenum and vanadium. This is regarded as being highly stain resistant. Usually a steel is regarded as stainless it is possible to maintain a chromium level above 12 wt% at the surface, since this has been found to form a stable oxide layer. 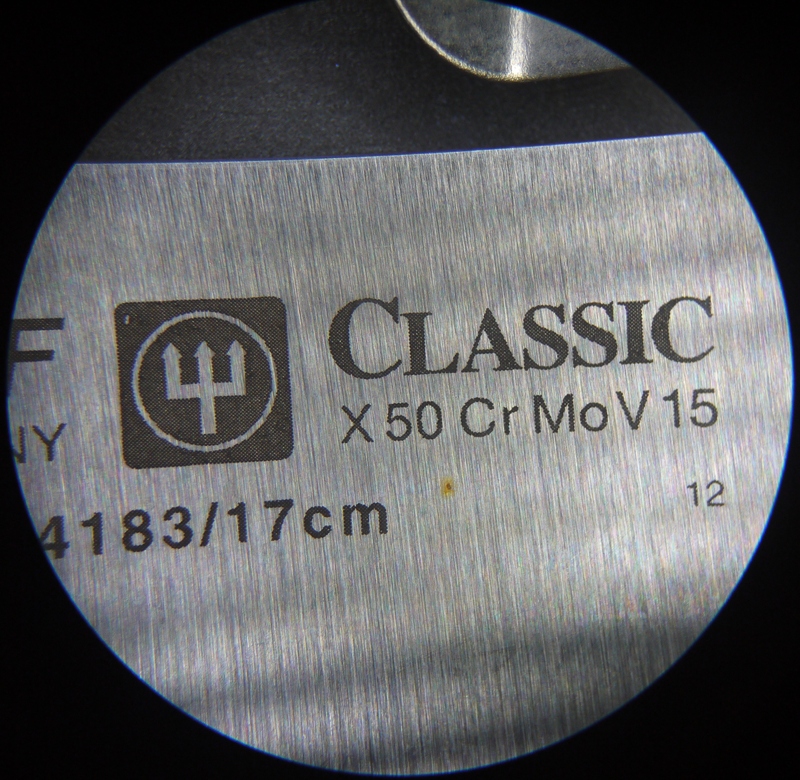 Z-knives have previously found that rusting occurred on X50CrMoV15 as a result of using dishwasher on otherwise unused knife. 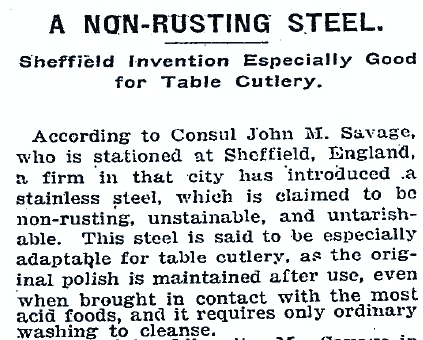 New York Times announcement regarding the discovery of stainless steel. This iconic car is well remembered because of it’s appearance in the Back to the Future movies. Now there are plans to build a small number of the cars. The DeLoreans will be built in a suburb of Houston, Texas, where Liverpool born Stephen Wynne has a 3,700 sq m warehouse chock-full of DeLorean car parts, which were sold by the liquidators when the company flamed out after less than two years of production. Until now Mr Wynne has been using the spare parts to maintain the 9000 cars that were originally built during the two years of production. The car was made with a stainless steel body, this saved on capital costs since no paint baking line was needed. Possibly a better solution than Henry ford making all of his Model-T cars black because the paint dried faster. The Gaurdian business supplement had a story in August covering the plans to resume production: Back to the Present for DeLorean. The UK government originally invested £78 million UKP to attract production of the DeLorean to Northern Ireland. That works out as a subsidy of £8667 UKP per car. Margret Thatcher became Prime Minister in 1979 and was a person who took a dim view of government subsidy of industry. However the cars were to be built in a employment black spot, and Nothern Ireland was a hot political issue. John DeLorean was arrested suspected of Drug Trafficking in 1982 by the FBI but was found not guilty in of the charges in 1984 after using a defense based on Entrapment – the accusation was that the money from trafficking was meant to bail out the ailing company. The new DeLorean company plans to make around 25 cars per year. With basic price of $58000 USD.